Chelsea boots can look effortlessly stylish. They have that kind of haven’t-tried-to-hard, slightly androgynous look which can look fabulous, particularly for fall. In this article we will give you lots of inspiration on how to wear Chelsea boots. Chelsea boots can be a tricky look to pull off. This boot length has the potential to make your legs look larger than they are by drawing a horizontal line right above the ankle. 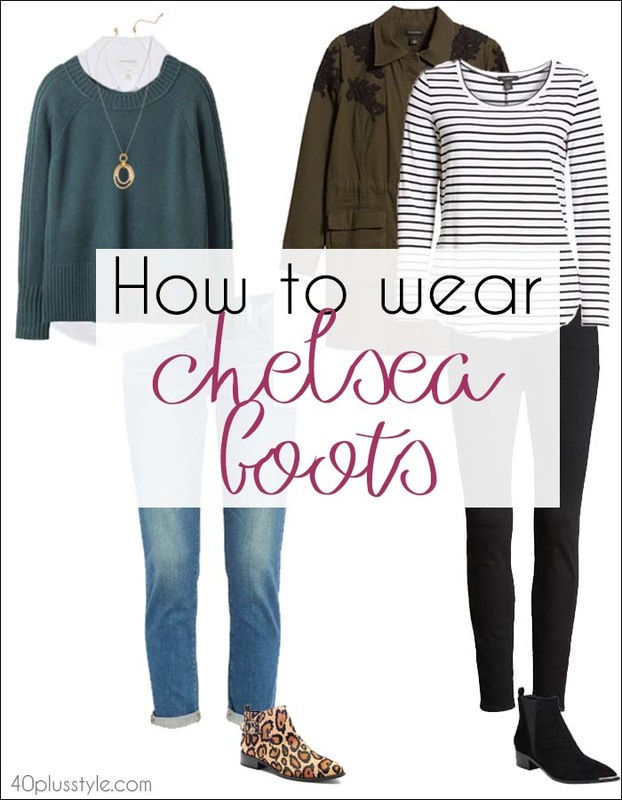 But there are plenty of outfit ideas which can make Chelsea boots a flattering option. Not only that, but they can also be one of the most comfortable types of footwear for you, as many Chelsea boots are flat, so you don’t have to worry about walking in heels if you don’t want to. First of all, what classifies Chelsea boots as Chelsea boots rather than any other ankle booties? They are generally defined as boots which are slim-fitting, ankle height, and which have an elasticated panel at the sides. Although, this season, I’ve seen lots of Chelsa boots where instead of the elastic panel, the side has been left open to create a cut-out effect. Chelsea boots can trace their origins back to Victorian times, so they’re definitely a style staple you will have in your closet for years to come. As such, they are one of the classic pieces that you can afford to invest a little more in as you know they won’t go out of fashion next season. You can wear your Chelsea boots with pretty much everything. Any jean style will go with them, but if you are wearing bootcut or boyfriend jeans, don’t try to tuck them. Instead, wear your jeans over your boots for bootcut, or create a cuff above them for boyfriend. Here are some more outfit ideas for you. Here are some of the most flattering Chelsea boots outfits you could try this fall, as well as tips and tricks to wear them so that they elongate your legs rather than visually cutting them off at the ankle. Most of us, unless we’re lucky enough to have long legs already want to create longer, leaner lines. Tucking your Chelsea boots into your pants can create a long leg line. It’s best to look out for jeans which are fitted so they fit neatly into your boots. Looking for jeans and boots which are similar colors such as these black ones below will also help to lengthen your legs if you are petite. Or you could try a pair of leggings instead. 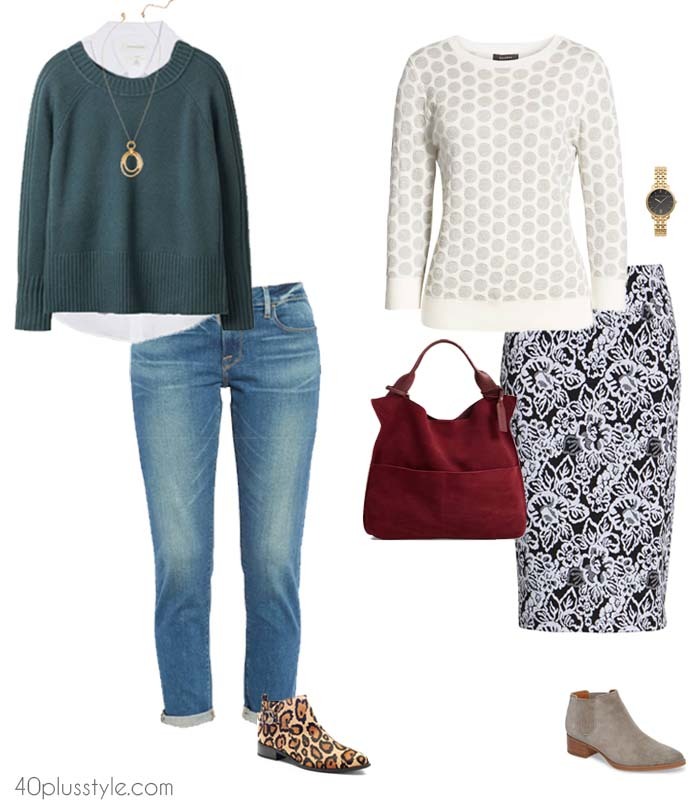 Check out these tips for more inspiration on what to wear with your leggings. If you want to create a tucked look, make sure your jeans or leggings are long enough so they fit into your booties. This is a look which is very on trend. But, it can be difficult to wear if you are petite or you have shorter legs because the cuff does have the visual look of cutting off your leg at the ankles. If you have longer legs though, this can be a great look. One way to create a nice look is to leave a little bit of ankle showing as your ankle is likely to be one of the slimmest points on your body. Choosing a pair of Chelsea boots which have a cut-out either at the front or at the sides will help to show off a little ankle. Wearing Chelsea boots with a dress is an ideal way to continue wearing your summer dresses during fall, or to transition from winter to spring when you no longer need longer boots. Just add some opaque tights if you need extra warmth. You can definitely wear Chelsea boots with a more fitted skirt. I would keep the look tonal, so if you’re wearing with tights, stick to boots in the same shades. Or, if you have bare legs, I find boots with a lighter hue work best. Dark shades can look heavy and draw the eye downwards. If you want to introduce some animal print into your closet, but don’t want to go too full-on, wearing it on your Chelsa boots is a very stylish option. Leopard print is a print which is always been on trend. Can you remember a year when leopard print wasn’t stylish? But, snake print is particularly on-trend for this fall. Either will look great. Do you already have Chelsea boots in your closet? Have you been inspired by these how to wear Chelsea boots ideas? I invested in a pair of Chelsea boots and I initially cringed at the amount I spent. Thankfully I am wearing them almost every day even with a blazer and skirt combo to work and I absolutely love them! I love chelsea boots. They are so easy to wear so it never looks like you’ve tried too hard. Plus they last for years because they never go out of style. Just reheel them and you’re away for another year. Great post.